Snapchat's parent company Snap said Wednesday US officials are looking into how forthright the company was with aspiring investors prior to its stock market debut last year. Snap Inc. has been responding to subpoenas and request for information from the Department of Justice and Securities and Exchange Commission, a spokesperson said in response to an AFP inquiry. The inquiries apparently stemmed from a class-action lawsuit filed against Snap by investors who contend the company didn't reveal how much of a competitive threat Snap faced from Facebook-owned Instagram. 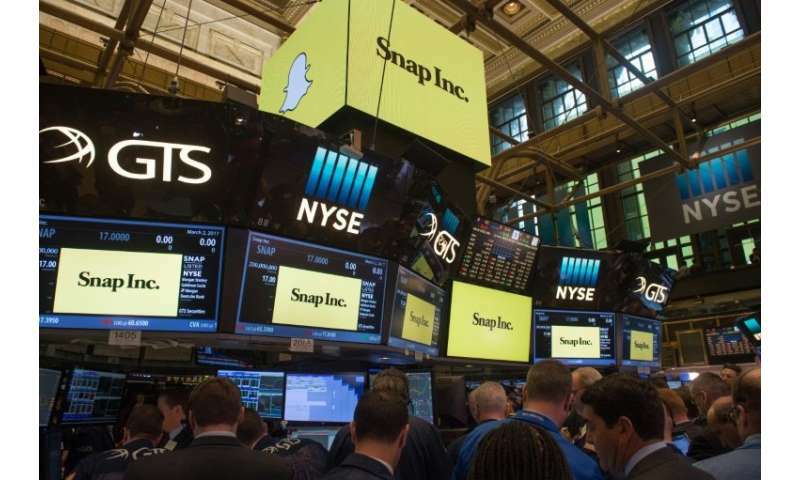 "It is our understanding that these regulators are investigating issues related to the previously disclosed allegations asserted in the class action about our IPO disclosures," the Snap spokesperson said. "While we do not have complete visibility into these investigations, our understanding is that the DOJ is likely focused on IPO disclosures relating to competition from Instagram." Snap disputed the lawsuit's claims, calling them "meritless," and said it would continue to cooperate with regulators. Snap shares were down 4.1 percent to $6.44 in late afternoon trading on the New York Stock Exchange. Shares were priced at $17 for Snap's initial public offering in March of last year. Snap came under selling pressure late last month after a quarterly report showing a loss of one million users even as it grew revenues and narrowed losses. Analysts say Snapchat has become the most popular social network among teens and young adults, but user growth has stalled as Facebook and its Instagram platform introduce services similar to those of Snapchat, known for its disappearing messages. Although Snapchat is best known for its smartphone messaging, it has also developed partnerships with numerous media outlets eager to reach its audience with news, video and other content. Snap recently announced it was launching a new slate of original video shows under its own brand in the latest move to spark growth.